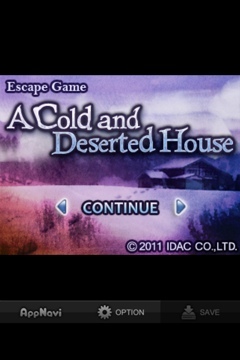 Escape Game: “A Cold and Deserted House”: Finally, IDAC gets it right! Click here for my walkthrough. 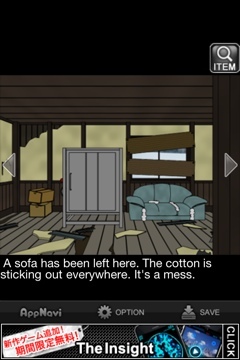 IDAC’s latest room escape game, “A Cold and Deserted House,” shows great improvement over their previous works. This was perhaps the first one that didn’t give me hostile feelings towards my iPhone. Although the gameplay is similar to all of IDAC’s escape games, this one has much better controls. There was only one point I found myself tapping a hole into my iPhone screen, and that was primarily my fault. For the most part, this game was very intuitive and straightforward. What I also liked about it was that there was more to interact with in the room than many of their other games. And most of the items you find will have multiple uses. They’ve even thrown a few red herrings into the game, which is very rare for them. Usually every item you can interact with has a use, but not here. This made it feel more like a real game that could actually be worth buying. Their games are becoming more complex, but luckily not more frustrating in the process. You were birdwatching and got stuck in a big blizzard, so you took shelter in an empty house. But you end up locked in, with the door frozen shut. Now you need to escape before another snowstorm comes! While not on par with IDAC’s 3D games, the graphics here are more impressive than their other 2D games. There’s more detail, more dimensions, and more objects with which to interact. As in most IDAC games, there is no music and the only sounds effects are the typewriter noises you here when you tap on something. This is a room escape game, and there’s no reason to play again once you escape. There are no alternate endings. This is one of my favorite IDAC games. I thoroughly enjoyed playing it, and wanted more when I was done. Usually with IDAC, I regret that I ever started. They have definitely improved upon their usual formula. If you’ve had a bad experience with IDAC in the past, don’t let that get in the way of trying this great escape game. Especially since it’a free! If you liked this game, make sure to check out Antrim Escape 3, Atmosfear and Closed Room. Previous PostContre Jour: New update and new Lite version. Next PostEllie – Help me out…please: Game Review: Can you help Ellie escape? Okay, where are the pliers? They’re in the wooden box to the left of the desk. Really enjoy the fresh appear. I liked this article. Appreciation for this superb entry. Unfortunately, it’s no longer free. $1.99.